Spring is almost here! Join us for a fun and easy workshop making fabulous adornments for your garden or flower pots. Learn basic glass cutting skills as you work from cheerful flowers, bees, ladybugs, owls, and bird templates. This relaxed class gives you the opportunity to cut and decorate your pieces with small bits of glass, frit (finely ground glass), millefiore, silver wire, and stringers. You may even be using a candle to bend your stringers to “draw” petal decorations, or feathers, and whimsical designs on your glass pieces. Silver wire and mixing certain colors of glass with each other can create beautiful metal reactions. 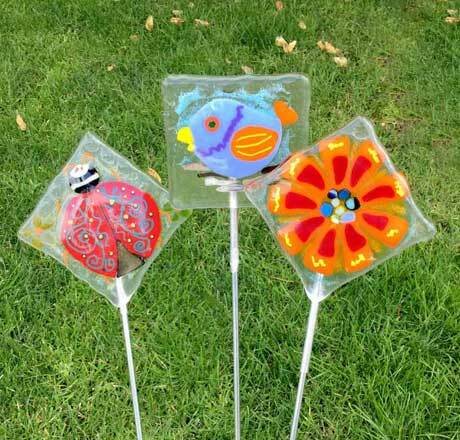 Your creations will be fired in our kiln and mounted onto aluminum rods for you to place in a flower pot or garden bed. Janie Yakovlevitch, nurse practitioner and glass artist, fits perfectly with our trend of medicine and mosaics. She has a long history of working with glass as a flameworker, and owner of GlassPassions. 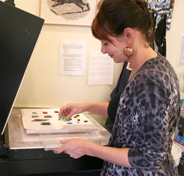 She began making mosaics at our studio fall of 2010 and officially joined the team as our “Fusing Director” in 2012. She runs the fusing program at SMA and is a constant inspiration to all of us, as she creates amazing backsplashes and other installations, combining all of her different glass working skills into stunning mosaics.